Just two days ago, we saw the renders of Samsung Galaxy A8 (2016) that were leaked online. 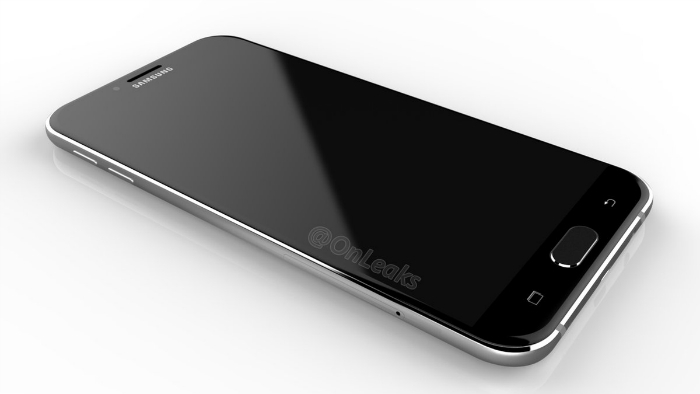 Thanks to those renders, we now know how the Galaxy A8 (2016) might look. 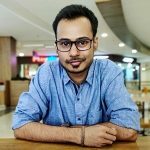 However, the design of Galaxy A8 (2016) is not the only thing that we have as the device has today popped up on AnTuTu revealing its specifications. 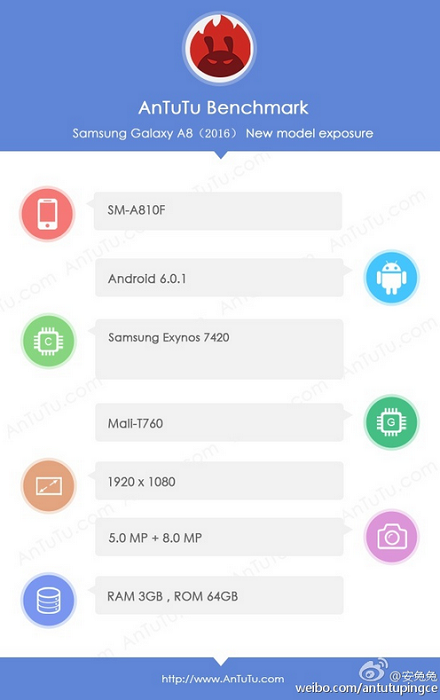 The Galaxy A8 (2016) has been listed on AnTuTu with model number SM-A810F. It is powered by Samsung’s Exynos 7420 SoC which is paired with 3 GB RAM and backed by Mali-T760 GPU. The listed device boots up to Android 6.0.1 Marshmallow and has a Full-HD display. The device will have 64 GB of internal storage along with a camera combo of 8 MP rear camera and 5 MP front camera. However, the Galaxy A8 (2016) has already made its appearance on benchmarking websites like GFXBench and Geekbench as well. And, the specifications listed on AnTuTu differ from the ones we have seen on GFXBench. The GFXBench listing says the device will come with 32 GB of internal storage along with 16 MP rear camera as opposed to 64 GB internal storage and 8 MP rear camera seen on AnTuTu. Well yes, the model numbers on both these listings differ, but we think there shouldn’t be so much of difference. Also, the GFXBench listing hints at a 5.1-inch display whereas yesterday’s renders point at a 5.7-inch screen. Well, a TENAA listing might help clear the confusion. What do you think?